Remember when the internet came along and everyone wondered whether there would still be a use for libraries? Oddly, just as the question was being called, in the early 2000s there was a building boom of new libraries around North America. 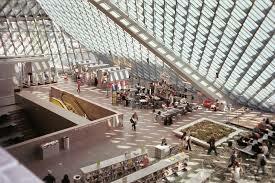 And public libraries didn’t die, they flourished, many reinventing themselves as community centers for the 21st Century. Digital visualization of 180,000 images from the New York Public Library’s public domain release. 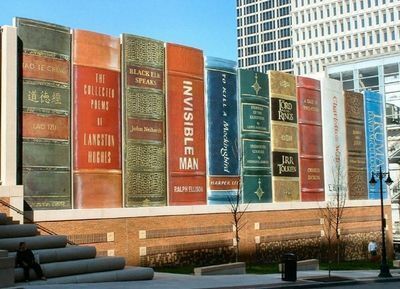 The idea of a public library is a powerful one. Libraries have played an important role in our culture, with two primary functions. They have been repositories of knowledge, but just as important is their role in sharing that knowledge. They have been critical in democratizing access to information. The internet can be seen as a kind of ultimate public library, with infinite stacks of information and hundreds of millions of librarians/users willing to curate, mix and share what they find. Access and sharing. If the wonder of the original internet was that it gave us access to the world’s information, its real power started to become apparent when it connected us not just to information but to each other and to one another’s networks. Dynamic networks of networks are infinitely more powerful than static information. The NYPL has put 180,000 images in the public domain online and invited visitors to use, remix and share them, essentially creating new work. Art and ideas are built on the culture that comes before it. By giving people access to its images and suggesting that that access doesn’t just stop with viewing the work but includes potential reuse as raw material, the NYPL escalates the public library’s traditional role of lender of physical books and sharer of the ephemerality of ideas to being a more active, potentially more interactive partner. In the old version of a library, access was limited by one’s ability to see inside. It’s difficult to know what you’re looking for if you don’t know it exists. By empowering new armies of curators/librarians and giving them the power and incentive to share and remix, the collections become suddenly more visible and more useful. We live in a time when people define themselves by what they share. They increasingly have expectations that they should be able to share whatever they encounter. Libraries are in the business of sharing. But the collections inside their walls, no matter how vast, are now smaller than what anyone with an internet connection has access to. So what will make libraries stand out in the infinitely shareable world? The NYPL is using its assets to position itself as an aggregator of information AND its audience of active users to be a much more powerful version of the traditional library. NYPL has realized that its real power isn’t so much in the collections that it controls but in the users it can empower. Your rare posts are always a delight and thought provoking. Might the limitation of the power of the Internet be its superficiality? We can use the Net to compile information more quickly than any time in history, but the information is generally basic, something like might be found in an encyclopedia. We are all the Renaissance Men of Wikipedia and ArtsJournal Cultural Literati, but for more in-depth knowledge, we still need major research libraries, which represent a different kind of power, but equally important. I think the Internet allows basic knowledge to gain social power through networks of people, but that for quite some time to come, in-depth knowledge, and especially original research, will still need to be collated from documents stored on paper. There are other even more basic issues. 92% of college students still say they prefer doing serious reading with print books. Aside from battery issues and hurting the eyes, the Internet is full of distractions. Serious long-term reading on it is like trying to build a house of cards on the back of a hysterical monkey. A network of hysterical monkeys can be very powerful in a mob-like way, but how deep is it? Aside from laboratory work, the true frontiers of knowledge will still be discovered by nerds in the dusty stacks of research libraries. Bill: I think superficiality is where you find it. Traditional libraries can be superficial too if you don’t know how to dig deeper. Yes, the internet is awash in superficiality, but it can also allow you to go into more depth than many research libraries. I think it’s a mistake to make a judgment about a medium simply by conjecturing how many (or “most”) people seem to be using it. For cancer researchers and patients, for example, the ability to collect and give access to data from vast numbers of people and genomic records revolutionizes the ways they can work on the disease. Internet access to weather data records help us understand climate change in ways that weren’t previously possible. And getting access to diversity of analysis and thinking by all sorts of experts is incomparably easier now. Yes the internet is full of distractions, and I think the embarrassment of distraction now possible suggests we have to think about what we choose to pay attention to in a more thoughtful way. Almost everyone I know worries about their ability to stay focused and concentrate. But the internet is still young. Imagine when books were first available and people had to learn how to use them; I’m betting it took some getting used to. The flood of the internet requires new skills in sorting and concentrating and being clear about what you want to consume. It will take some getting used to. But no, I don’t think the internet is inherently superficial just because that’s the way many people use it. I agree that the information on the web is massive and that it has qualities that are enormously useful in ways libraries cannot offer. At the same time, I feel for example, that reading Richard Ellman’s biography of Oscar Wilde will give me an in-depth treatment about his life that that the large amount of shorter works on the web do not offer. I also feel that the web has not replaced library archives – though research in archives can lead to new material being put on the web. The Vienna Phil, for example, recently opened its archives with the result that two new books have been written about the orchestra’s Nazi history. This research then led to about 30 articles which were put on the orchestra’s website in PDF format. I think we might also eventually find that the web contains serious epistemological biases that are not found as strongly in libraries . Authors like Kevin Kelly, Executive Editor of Wired Magazine, enthusiastically embrace the web as a manifestation of American democracy and neo-liberlaism. In his book, _Out of Control: The New Biology of Machines_, he advocates the economic theory of “disorganized capitalism,” and suggests that the “natural order” of the free-market creates a form of “control without authority” such as might exist in a bee hive or a flock of birds. In an article no longer on the web, entitled “‘The Nine Laws of God’: Kevin Kelly’s Out of Control Techno-Utopic Program for a WIRED World,” William Grassie argues that Kelly’s laissez-faire neo-liberalism is flawed because it leaves the technology of global corporatism without an adequate system of checks and balances. This is becoming an epistemological and ontological cultural system shaped by the biases of American information technology. For one example, the Internet’s lack of regulation, which was promoted as an ethic to protect free-speech on the “Information Super-Highway,” was easily subsumed by E-Commerce. An “anarchy” originally planned to protect free-speech and tolerance, was transformed into a system of laissez-faire capitalism that now defines a large part of the Internet’s general character. Grassie asserts that in the current cultural, political, and economic context, Kelly’s neo-liberalism “turns out to be fully committed to a kind of Social Darwinist laissez-faire social-techno-evolutionary non-policy.” In this wired, Darwinsitic free-market, the ruling status quo, as represented by the financial and media interests of society, are given powerful new tools to shape cultural values on a global scale. In short, the Net now deeply colors our cultural and intellectual lives with a Darwinistic, neoliberal ethos that libraries never could have. Most importantly, whether it be the global economy or an e-mail list, the instantaneousness of modern information creates a kind of tribal uniformity that can silence or ghettoize those who are different. I think this is readily observable in many Internet forums. This raises important questions. Will the Internet be one more tool allowing American laissez-faire capitalism to create an ever-increasing form of globalized cultural and intellectual uniformity? Will neo-liberalism’s powerful business interests lend the Internet an increasingly homogenizing cultural ethos that only appears to be anarchic and unregulated? What are the mechanisms that grant neo-liberalism’s Darwinistic definition of information technology an epistemological privilege, and -how- does it marginalize those who are different? And on a more speculative, microscopic level, is there a form of cultural isomorphism at work that creates a correlation between the neo-liberal ethos of the Internet and the tendency for many forums to be mostly comprised of whites, if not white males? Another critique of Kelly’s book, by Richard Barbrook, entitled “The Pinnochio Theory,” provides some specific political responses from a European perspective. He asserts that the Net is an extension of a Darwinisitic, anarchic, laissez-faire capitalism that challenges the traditions of Europe’s social democracies. So I think we need to carefully consider the values of the Internet and who benefits from them. On one hand, neo-liberalism’s presumed anarchy guarantees certain kinds of freedom and creates a fragmented diversity. But on the other, it creates a totalizing, global and yet “tribal” norm based on American neo-liberal capitalism that deepens the marginalization of those who are different – including even Europeans. Over the long term, among many other things, this might contribute to weakening some of the more valuable political and cultural traditions of Europe’s social democracies. I think we need to consider these problems. It would seem that the tribalizing networks of the Internet, and their concepts of a kind of extreme, Darwinistic capitalism that shouts down all other views, contains fundamental epistemological biases that libraries don’t. Quite right. But – and maybe I have only realized this now with your comment – I have oddly come to consider books themselves as part of the web. For me, the issue of reading or getting information has never been that it doesn’t exist; it’s been knowing it is there, being able to sort out whether it’s useful and figuring out where to find it. In the absence of the web, that information doesn’t exist for me because I don’t know it does, sometimes even if I search diligently. By creating a whole web of information about Oscar Wilde, I can develop context and understand that if I want depth I can go to the Ellison biography. And increasingly, those book are downloadable for my e-reader. In pre-web days, not only might I not know about the authoritative resource, but I might not have access to it even if I did. I go back to my original post – two fundamental roles of a library are to be a repository of information (storehouse of books) AND a connector/sharer that lets you know where what you’re looking for is if it doesn’t happen to be in the local collection. Massively expanding the connector role through technology is a huge opportunity. I (and many others) share your anxiety about who controls information. The web can seem like an anarchic free-for-all that defies manipulation. However, we all know that people are trying to manipulate it every day, usually in unseen ways. But I get uneasy when people start talking about the “values” of the internet – good or bad. It’s not that I don’t think there are values the internet can be used for. But I tend to – perhaps naively – think of the internet as amoral. Paper can be used for evil purposes too but paper doesn’t have moral values. The internet is a medium that can be used for good or evil – it by itself doesn’t express values. The danger of marginalization is very real. But the internet also can allow marginalized people and cultures to connect in ways that maybe weren’t previously possible. I’m astonished by the cultures and online communities I stumble on who have found one another. The flip side of course is that the internet can be a blunt force tool to hammer down anyone who’s different And it also gives voice to a lot of awfulness, people who, having found one another and become a mob, believe they have power to impose their ideas on others. The point is, it’s probably impossible to say at this point “the web is this” or “the web is that” because it can be both. All. Depends on who’s using it.